You might be surprised at how many of the wonderful herbs that you love are also loved by butterflies and their offspring. This is one of those times where you can truly have your cake and eat it too. My suggestion would be to include some non-edible, flowering butterfly favorites too but there are quite a few herbs that could keep your winged friends returning season after season. Butterflies have a variety of needs. The more of them you can satisfy, the more likely your edible butterfly garden will become a haven for them. Sunny & Warm Places – butterflies are cold blooded. They need sunny resting places to warm their wings for flight. 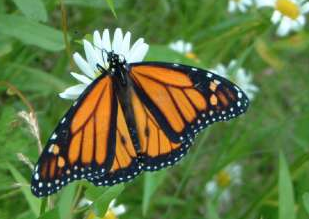 Protected Places – places that provide both butterflies and caterpillars cover from predators. Water Source – butterflies need water. Shallow puddles and pans can supplement natural sources. Nectar Herbs – herbs that produce flowers with nectar that adult butterflies like to eat. Host Herbs – think of host herbs like the garden nursery. These are herbs where butterflies like to lay their eggs and will provide food for growing caterpillars. The first three items on our edible butterfly garden checklist are pretty self-explanatory; so let’s get to the herb list. But, before I begin, consider where you live, the types of butterflies that visit your area and the types of herbs that grow well in your garden. This particular list is designed to attract Monarch butterflies but a number of other species will also enjoy these herbs. My only advice is to pick carefully. Butterfly eggs are tiny, Monarch butterfly eggs are the size of a pin head, but they are often laid in bunches. I live in the southeastern United States. There are a fairly large variety of butterflies that visit my country and while I would love to build a site all about the butterflies of the world, I will only be sharing with your edible gardening ideas for butterflies that I might find in my own garden. The first edible butterfly gardening article that I am sharing with you is about creating a welcome place in your garden for these beautiful black and orange butterflies. They are fairly common in North America and though their winter home is in Mexico, they are even found as far away as Hawaii and Australia. Read Edible Butterfly Gardens for Monarch Butterflies. The second in this series of butterfly gardening is my article on Herb Gardens for Swallowtails. Swallowtails can be found all over the world and if you plant some of their favorite herbs, they might come visit your garden too. An added bonus of planning an edible butterfly garden is that many of the flowering herb plants favored by butterflies are also favorites of hummingbirds and honey bees. Attracting Butterflies & Hummingbirds to Your Backyard: Watch Your Garden Come Alive With Beauty on the Wing is full of helpful tips and hints on which plants attract which birds and butterflies, how to identify butterflies and caterpillars, and provides several garden designs.